Recipients of the Jim Kennedy Scholarship Fund spanned eight states. The Jim Kennedy Scholarship Fund supports higher education for children of Cox employees. August 16, 2016 /3BL Media/ - Cox Enterprises announced today the recipients of scholarships provided by The Jim Kennedy Scholarship Fund. The Fund supports children of Cox employees and annually awards ten $10,000 scholarships. The scholarship is automatically renewed for up to three additional academic years - reaching a total value of $40,000 – if the student meets the established criteria. Dayvion Broach: A graduate of Grayson High School in Loganville, Ga.
Kaylani Brown: A graduate of Olympian High School in Chula Vista, Calif.
Taylor Cronin: A graduate of West Warwick High School in West Warwick, R.I.
Joshua Diaz: A graduate of Desert Pines High School in Las Vegas, Nev.
Michael Grigsby: A graduate of Midwest City High School in Oklahoma City, Okla.
Ayanna Howard: A graduate of the Westminster Schools in Atlanta, Ga.
Tristan Loser: A graduate of Chaska High School in Chaska, Minn.
Gabriella Marchione: A graduate of Northview High School in Duluth, Ga.
Joseph Mazurkiewicz: A graduate of Great Neck South High School in Lake Success, N.Y.
Sophia Sandoval: A graduate of Yutan High School in Yutan, Neb. The scholarships are funded by Jim Kennedy and are open to high school seniors with a parent who has worked full time at a Cox company for at least three years. 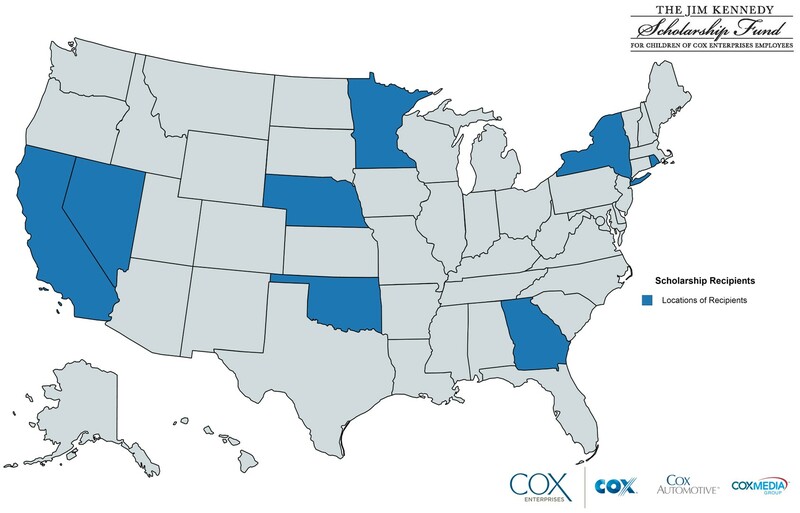 Cox Enterprises’ major divisions are Cox Communications, Cox Automotive and Cox Media Group. View a Jim Kennedy Video about the Fund.